Finally, a chance for pretty blonde girls to feel special! Armed with fierce athleticism and superior smarts, these expert agents serve the forces of justice. Here I was, all set to tell you how Sharon Carter was a SHIELD agent who was introduced as the younger sister of Captain America's WWII girlfriend Peggy, but has since been demoted(?) to her niece thanks to the sliding comicbook timeline. But then I realized we'd already explained all that, the last time Sharon got a Marvel Legend! She and Cap cross paths on many missions, and they eventually fall in love. But she was apparently killed while undercover in a white supremecist group, so that was that. Then, 16 real-world years later (about 5 years in comic time), Mark Waid brought her back. He made her a rather cynical character, contrasting with Cap's idealism and giving him someone to play off of - so basically, the way Black Widow was treated in Winter Soldier. Which clearly, isn't a bad way to play it at all! Sharon (whose SHIELD codename was "Agent 13") gets a new head, with her long blonde hair pulled back into a large wavy ponytail. The face was sculpted by the same unknown person or persons who did Wasp and all the others. It's got a narrow, pointed chin and a sharp nose. The eyes are even painted closer to the right spots this time! However, there's a bit of a disconnect between the head and the body. Rather than just sticking with the "Marvel's Madames" body, she reuses Maria Hill's sculpt. It definitely works for her - it's a spy catsuit and has spots for SHIELD insignias on the shoulders - but it's sculpted to look like a real-world garment, while the head is more cartoony. It's not a huge gap in styles, but it's there. The shirt has a short raised collar, and a zipper that runs all the way down the front. There are raised panels on his shoulders, biceps, torso, the outside of her legs, and around her knees. She wears a black belt that floats freely around her waist, but connects solidly at the thighs thanks to her (purely decorative) holsters. There are wedge heels built into her boots, but her feet seem too small for her body. In a very welcome move, her outfit is pure white: no painted shadows that are meant to add depth but only succeed in making the figure look like it's been rolling around in a blueberry patch. The articulation is unchanged from Maria Hill: ankles, knees, thighs, hips, chest, wrists, elbows, shoulders, neck and head. The head is on a balljoint, and it's the same size as the old Sharon, opening up lots of swapping possibilities - only thing that won't match is the skintone. 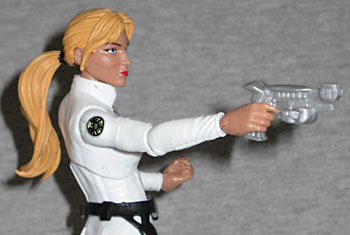 While the pistols in her holsters aren't actually removable, she does still get to carry a gun. It's the same weird one Red Skull came with, which is kind of appropriate, since it was Red Skull who orchestrated Steve Rogers' assassination with Sharon as the one pulling the trigger. Her piece of the Red Onslaught Build-A-Figure is the right leg. It's big enough that it almost comes all the way up to Sharon's armpits. He's gonna be a big one! It's kind of weird that Agent 13's modern costume is an all-white jumpsuit, since that's basically an updated version of the National Force outfit she seemingly died in. Imagine a cop infiltrated the KKK, and when he got out, kept on wearing robes (or the pretend-law-enforcement uniforms those wimpy bigots have started wearing now). It'd be weird, right? But that's kind of what Sharon is doing. This isn't the most exciting figure in the line, but she's a fairly important character and an update was welcome.